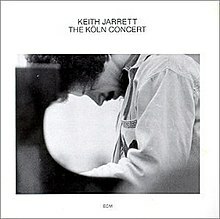 The Köln Concert is a concert recording by the pianist Keith Jarrett of solo piano improvisations performed at the Opera House in Cologne (German: Köln) on January 24, 1975. The double-vinyl album was released in the autumn of 1975 by the ECM Records label to critical acclaim, and went on to become the best-selling solo album in jazz history, and the all-time best-selling piano album, with sales of more than 3.5 million. The concert was organized by 17-year-old Vera Brandes, then Germany's youngest concert promoter. At Jarrett's request, Brandes had selected a Bösendorfer 290 Imperial concert grand piano for the performance. However, there was some confusion by the opera house staff and instead they found another Bösendorfer piano backstage – a much smaller baby grand – and, assuming it was the one requested, placed it on the stage. Unfortunately, the error was discovered too late for the correct Bösendorfer to be delivered to the venue in time for the evening's concert. The piano they had was intended for rehearsals only and was in poor condition and required several hours of tuning and adjustment to make it playable. The instrument was tinny and thin in the upper registers and weak in the bass register, and the pedals did not work properly. Consequently, Jarrett often used ostinatos and rolling left-hand rhythmic figures during his Köln performance to give the effect of stronger bass notes, and concentrated his playing in the middle portion of the keyboard. ECM Records producer Manfred Eicher later said: "Probably [Jarrett] played it the way he did because it was not a good piano. Because he could not fall in love with the sound of it, he found another way to get the most out of it." Jarrett arrived at the opera house late in the afternoon and tired after an exhausting long drive from Zürich, Switzerland, where he had performed a few days earlier. He had not slept well in several nights and was in pain from back problems and had to wear a brace. After trying out the substandard piano and learning a replacement instrument was not available, Jarrett nearly refused to play and Brandes had to convince him to perform as the concert was scheduled to begin in just a few hours. Brandes had booked a table, at a local Italian restaurant, for Jarrett to have dinner, but a mix-up by the waiting staff caused a delay in the meal being served and he was able to eat only a few mouthfuls before having to leave for the concert. The concert took place at the unusually late hour of 23:30, following an earlier opera performance. This late-night time slot was the only one the administration would make available to Brandes for a jazz concert – the first ever at the Köln Opera House. The show was completely sold out and the venue was filled to capacity with over 1,400 people at a ticket price of 4 DM ($1.72). Despite the obstacles, Jarrett's performance was enthusiastically received by the audience and the subsequent recording was acclaimed by critics. It remains his most popular recording and continues to sell well, decades after its initial release. The performance was recorded by ECM Records engineer Martin Wieland, using a pair of Neumann U 67 vacuum-tube powered condenser microphones and a Telefunken M-5 portable tape machine. The recording is in three parts: lasting about 26 minutes, 34 minutes and 7 minutes respectively. As it was originally programmed for vinyl LP, the second part was split into sections labelled "IIa" and "IIb". The third part, labelled "IIc", was actually the final piece, a separate encore. A notable aspect of the concert was Jarrett's ability to produce very extensive improvised material over a vamp of one or two chords for prolonged periods of time. For instance, in Part I, he spends almost 12 minutes vamping over the chords Am7 (A minor 7) to G major, sometimes in a slow, rubato feel, and other times in a bluesy, gospel rock feel. For about the last 6 minutes of Part I, he vamps over an A major theme. Roughly the first 8 minutes of Part II A is a vamp over a D major groove with a repeated bass vamp in the left hand, and in Part IIb, Jarrett improvises over an F# minor vamp for about the first 6 minutes. All compositions by Keith Jarrett. Subtle laughter may be heard from the audience at the very beginning of "Part I", in response to Jarrett's quoting of the melody of the signal bell which announces the beginning of an opera or concert to patrons at the Köln Opera House, the notes of which are G D C G A. Unlike the other parts of this concert, "Part IIc", the encore, was based on a precomposed tune, the form and melody of which can be found in certain Real Book compilations as "Memories of Tomorrow". This was and remains common practice for Jarrett. Note, for example, that his encores for performances in Bremen (released on Solo Concerts: Bremen/Lausanne) and Tokyo (Last Solo DVD) are on the same vamp-based tune. He is also fond of closing his solo concerts with Tin Pan Alley standards, particularly "Over the Rainbow". The Nicolas Roeg movie Bad Timing has part of the concert in its soundtrack. The Nanni Moretti movie Caro diario (Dear Diary) has part of the concert in its soundtrack. In a 1992 interview with the German magazine Der Spiegel, Jarrett complained that the album had become nothing more than a soundtrack. "We also have to learn to forget music," he added. "Otherwise we become addicted to the past." Subsequent to the release of The Köln Concert, Jarrett was asked by pianists, musicologists and others, to publish the music. For years he resisted such requests since, as he said, the music played was improvised "on a certain night and should go as quickly as it comes." In 1990, Jarrett finally agreed to publish an authorized transcription but with the recommendation that every pianist intending to play the piece should use the recording itself as the final word. A transcription for classical guitar has also been published by Manuel Barrueco. The first interpretation of the transcription was recorded by the Polish pianist Tomasz Trzcinski and published on the 2CD Album Blue Mountains in 2006. In 2011 the Witness programme on the BBC World Service broadcast "Keith Jarrett in Cologne" in which Vera Brandes describes the difficulties surrounding the performance. ^ Jurek, Thom (2011). "The Köln Concert - Keith Jarrett | AllMusic". allmusic.com. Retrieved 14 July 2011. ^ Cook, Richard; Morton, Brian (2008). The Penguin Guide to Jazz Recordings (9th ed.). Penguin. p. 768. ISBN 978-0-141-03401-0. ^ Swenson, J., ed. (1985). The Rolling Stone Jazz Record Guide. USA: Random House/Rolling Stone. p. 112. ISBN 0-394-72643-X. ^ Rigby, Paul. "KEITH JARRETT - THE KÖLN CONCERT". Record Collector. recordcollectormag.com. Retrieved 14 June 2018. ^ Fordham, John (31 January 2011). "50 great moments in jazz: Keith Jarrett's The Köln Concert". The Guardian. Retrieved 2011-02-03. ^ a b c d Da Fonseca-Wollheim, Corinna (11 October 2008). "A Jazz Night to Remember: The unique magic of Keith Jarrett's 'The Köln Concert'". The Wall Street Journal. Retrieved 2011-02-03. ^ "The Köln Concert". Bösendorfer. Retrieved 2011-02-03. ^ Fonseca-Wollheim, Corinna da (2008-10-12). "A Jazz Night to Remember". Wall Street Journal. ISSN 0099-9660. Retrieved 2017-08-13. ^ a b "Keith Jarrett in Cologne". BBC World Service. 1 Nov 2011. Retrieved 23 January 2019.